Troy and Tammy Wolbrink: Financial Programmers Unite 2012! Last month, God brought together a group of Campus Crusade for Christ missionaries from around the world who serve as software developers. Together we build tools that help keep the ministry running smoothly. It was a great time for us to share all that we’ve been working on. Often it’s hard to see how our pieces of the puzzle fit together. Many of those in attendance were developing software that connects to my software over the Internet. I received some helpful feedback, and I was encouraged make these connections in person. 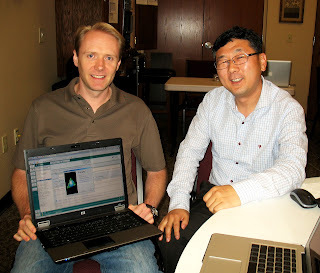 One of the connections I made was with Daniel KO, from South Korea. He and his team have developed some great tools to help their staff run their ministry. But he was looking for ways to help their staff in the area of fund development. I showed him my software. Thankfully my software was already translated into Korean! He’s very interested in our software, so I’ll be in contact with him soon to help make this happen. A verse that seems to really fit is Exodus 18:18, "The work is too heavy for you; you cannot handle it alone." Thank you so much for your continued support that helps sustain us as we serve the Lord in ministry!